Yasmin is a contraceptive pill. It is a monophasic pill which means all 21 pills in the strip contain the same amount of hormones. After 3 weeks of taking Yasmin, you don’t take any pills in week 4 to allow menstruation. After that you continue with a new strip of Yasmin for another 3 weeks. 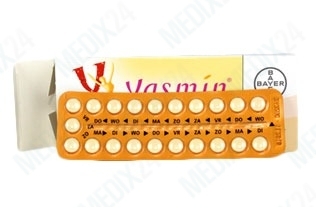 How does Yasmin contraceptive pill work? 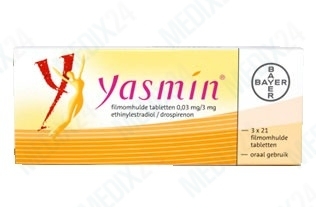 Yasmin is a combination pill which means it contains two hormones: ethinylestradiol and drospirenone. These hormones prevent ovulation, the body does not release an egg and should therefore not become pregnant. At the same thime the hormones alter the lining of the womb, therefore making it harder for an egg to nestle in the uterus. Women who use a contraceptive pill usually experience lighter and less painful periods. Yasmin is a new generation pill which is often used by young women, it has less side effects than some other contraceptives. All forms of combination contraceptives increase the chance of thrombosis. This can develop atany time, regardless of how long you have used Yasmin. Thrombosis can block a vein or artery and thus even lead to death.